As we wrap up season 1 of Becoming a Geek Leader, I introduce the 4 levels of awareness in becoming a geek leader – which level are you on today? In this episode, you’ll hear some highlights from the season and I show you how I’ve been covering ideas linked to these levels all season long. Recording: [00:00:00] Become the Geek Leader, Season One, Episode 10. [00:00:11] We all want to grow our skills and improve the work we do. But who has time for that? In this online blended learning program, you and your team will gain practical skills in topics like time management, dealing with difficult people, improving communication, and so much more. [00:00:31] Train your whole team for less than $500. Each lesson is 30 minutes or less, so it fits right into your current team meeting schedule. Find more information and get immediate access to your first free lesson at brighthillgroup.com/helpinggeeks. That’s brighthillgroup.com/helpinggeeks, so that you can get access to the Geek to Great 101 course. [00:01:02] Welcome to the Becoming a Geek Leader podcast. My name is Tom Cooper. As a geek, I’m on a mission to figure out better ways to lead others at work and at home. Through the Becoming a Geek Leader podcast, I’m sharing what I’m learning, so I can help make you more effective at leading people too. Ready? [00:01:25] As I get started today, I want to offer a hearty and heartfelt thanks to my son Joel for stepping in for me for the last episode. Wow, was I out of it. And I appreciate him for helping me out and for making sure that you had a new episode, too. [00:01:41] I cannot believe how quickly we got here. This is episode 10! It’s the end of season one. When I started planning this podcast back in the summer of 2015, I wanted season one to focus on how to help you as a highly technical expert get even better at influencing the people around you. [00:02:03] During today’s episode, I want to take a quick look back at the season as a whole and give you some insights into what I have planned for season two as well. Now, during season one, I planned a set of topics that I know that folks like you are facing every day. You also have my promise that I’m gonna be sharing with you the things that I’m learning as I work with clients. [00:02:29] In this finale episode, I want to introduce you to one of those learnings that I’ve come across. I’ve discovered that there are four levels of thinking that all geeks develop as they grow in their leadership. Now, I’m gonna share with you those four levels today, and I’m gonna show how what I’ve already covered in season one links directly to those levels of thinking. [00:02:53] In our episode hack today, I’m gonna help you figure out where you are and what your next step is in the process. Let’s get started. [00:03:05] In the Thought Leader Segment, Tom brings in ideas from today’s best thought leaders. Tom: [00:03:24] Let’s talk about the four levels of thinking for geek leaders. Level one is individual; I’m an individual contributor and my work matters. Level two, team performer; I’m more than just a technical expert, I’m a part of a team making things happen. Level three, team leader; now I’m responsible for actually leading a team of others. And level four, team builder; I need to help develop other team leaders who will grow more teams. 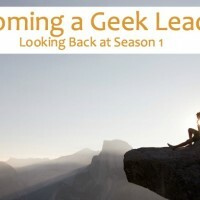 [00:04:02] Now, I’ve got a download for you on the webpage for this episode that is just a one pager on the four levels of thinking for geek leadership. And I want to encourage you to take a moment to go ahead and download that. [00:04:16] Most of us only get as far as level one or level two, and frankly nobody ever talks to us about levels beyond that. Whether we’re an individual contributor or a member of a team, we might get some guidance about what to do with that. But people don’t talk to us about what does it mean to become the boss or to think about growing other bosses. [00:04:39] In future episodes, I’m gonna go into deeper detail about how do you move from your current level to a higher level. And in this episode, as I mentioned, I’m gonna go back and talk about how I’ve already covered critical ideas that can help you on your journey. [00:04:56] As I look back over season one, one thing I realize is I didn’t spend much time at all talking about level one. Now, I think that’s because I’m assuming that when you’re listening to a podcast called Becoming a Geek Leader, you’ve already realized that you have to go beyond your technical skills if you want to deliver higher-level work. [00:05:18] The idea in level one, just at its core, is that when we start in our career, we get geekier and we get paid more. The deeper our technical skills go, the stronger our technical skills go, the more we get paid. The challenge is that there’s a limit to that, because that stops working after about four years, maybe five years into our career. We get stuck. We don’t get the promotions and raises we expect. We’re frustrated about it. Or, even worse, maybe we get promoted to a job where we’re supposed to lead others, but we don’t know anything about how to do that and we get really frustrated. [00:05:55] In level one, with that level of awareness, with that level of thinking, we become aware that technical skills are necessary but not sufficient. It takes more than geek skills to help us move ahead in our career. I touched on this in episode three when I was asking what is your plan for career development? [00:06:44] Well, Dan Hardy asked me this question. He said, “What’s your E2E ratio?” E2E, your education to entertainment ratio. How much do you spend on your personal development versus how much do you spend on your entertainment? If you’re like me, ouch; it didn’t feel good. [00:07:06] What if you spent half as much on your personal development as you do on the sum total you spend on movies, eating out, hobbies, and cable? Do you even know how much you spend on those things? All right. So maybe you look at that and you go, “Man, I couldn’t spend that much.” And I think, actually, if you add it up, you’ll be stunned at how much you do spend on just those categories. [00:07:30] But let me ask you this. What if you invested 10% of your income in yourself? What if you bet on you just 10% of the income that you make? Just think about this for a second. What conferences would you be able to attend? What courses would you be able to take? What would happen in your career if you had a coach helping you get to that next level? I want you to think about your E2E ratio. What’s your education to entertainment ratio? [00:08:05] I came back to thinking about that idea a little bit more in episode seven when I asked the question, “Are you working on the strategically important stuff?” And I have to say, when I was working for the hotel company and I was using software deployment to solve problems on computers with viruses as well as get the reservation system up and running, I loved that project. I loved that work. I could see exactly how it was helping our customers and how it was helping with our sales. And it was fantastic. [00:08:38] The problem was that I was part of a hospitality brand. I wasn’t part of a technology firm. And the company saw value in the software distribution stuff, but really it was fairly limited in terms of the value that it brought. I invested a lot of energy in that, thinking that it was a strategic help to the company. Don’t get me wrong. It helped the company. But it didn’t help the company enough to continue to get the support that we needed to do it organizationally, or to help me from a career standpoint. [00:09:10] What if you’re looking at your projects and you’re looking at the strategic problems the company is working on and you just don’t see any way that your project is tied into a strategic problem? Well, I have to tell you, it was painful for me to recognize that when I was working on software deployment and there’s only so much value to those solutions. No matter how elegant they are, no matter how cool they were, no matter what great things they did, they only did so much. [00:09:37] If that’s the case, maybe what you’re working on just isn’t that important to the organization. If you want to have your career continue to move forward, you probably are going to need to look for opportunities that you can work on projects that really do tackle the big-rock problems that your organizations have. [00:09:56] I spent too long working on projects like software deployment that just didn’t have enough value to the organization and I missed out on career opportunities because of it. In the time that I worked there, I was there for 10 years, for heaven’s sakes, I could have changed jobs. I could have changed departments. I could have even changed major divisions, and I could have continued to help the company solve big problems. [00:10:16] I stuck around because I loved what I was doing and it limited me. I think I could have found a job that I loved in another part of the company that I would have been happy with, too. I just wasn’t looking because I thought, “Oh, this is really important.” Unfortunately, it wasn’t important enough. [00:10:32] So those were a couple of areas in season one when I talked about that level one, that individual level. Now let’s turn the corner and talk a little bit about level two, team member. Performing as a team. In this thinking, I’m part of a team, and I need to work with others. Now, a good part of season one was exactly that; was working with others. In fact, in episode four, I talked about dealing with difficult people. [00:11:06] Now, there is another topic that I want to touch on here. And it’s a danger. It’s actually something that we do mentally that can be a big problem for us. And the concept that I want to share with you is the idea of the bozo bit. And we know that bits are either one or zero; they’re either on or they’re off. And if a bit is on, then it’s 100% on, and if it’s off, it’s 100% off. [00:12:11] When you have set the bozo bit in the on position, now all of a sudden it doesn’t matter what they say. If they say anything, as far as you’re concerned, you have a filter. And your filter says, “A stupid person said this.” And when you believe that a stupid person said this, all of a sudden you don’t hear them anymore. It doesn’t matter. [00:12:40] They might come up with something that is insightful. Something that is useful. Something that is helpful. But you won’t be able to hear it because your filter is gonna say, “A stupid person said this.” Now, as I said, in some cases it’s true that whoever’s talking has no idea what they’re talking about. But let me challenge that. Because, statistically speaking, it’s a very small percentage of people who are hopeless idiots. It is more likely that they are doing something that works for them. They’re optimizing for something different than what you’re optimizing for. They’re being recognized and rewarded for different things than you’re being recognized or rewarded for. [00:13:30] And it’s your job to figure out, are they a hopeless idiot and you were correct to set the bozo bit? Or maybe, just maybe, you’ve made a mistake. Maybe you shouldn’t have set the bozo bit for this particular person. So if you’re analyzing whether you’ve incorrectly set the bozo bit to the on position, here’s some things to think about. [00:13:54] One key tool for influencing others is making sure that they feel heard, listening well. In episode two, I gave you some specific tips to help you listen more effectively. Mark Goulston, who is the author of a book called Just Listen. One of the key points that he made is that people are craving to be understood. We’re so busy, nobody has time to think. And we’re just dying to have a safe place where we can be heard. [00:14:27] The key point that he brought up is the idea about being a first-class noticer. Now, a noticer goes beyond just listening to the facts. It’s not looking or watching or seeing what’s happening. Those things are kind of passive. What he is thinking about and encouraging us to think about is, as you’re talking, look at the engagement level of the other person. And that our job is to be present and to be attentive and to be intensely curious about the other person. And that’s hard. It takes a lot of energy. [00:15:10] And the key thing about being intensely curious about the other person, it starts with noticing their body language. Are they making eye contact with you? What’s their hand movement? Is it really subdued or is it really intense? Are they moving closer to you or farther away from you? Do they seem kind of open with their arms and their legs open? Or are they kind of closed off, folded arms and crossed legs and that sort of thing? [00:15:36] What you want to be doing is being intentional about noticing what’s going on. Another part of working well with others is resolving conflict. And we know this is a constant challenge. In episode nine, I shared with you a simple way to resolve conflict with other people. So think x, y, z. In situation x, when you did y, had z impact. So, what was the situation? It was during the team meeting. Not, “you always,” or, “you have a tendency to,” or “people say you,” no. [00:16:16] In this specific situation, it was during the team meeting when the boss asked for my ideas about the project, so that’s situation x. You did y. You rolled your eyes. You folded your arms. You sighed. You looked away. You had z impact. It felt like her boss rejected my idea because of your reaction, at least in part. I didn’t like it. I didn’t like the way it felt. [00:17:28] Now, you’re not attacking him. You’re not criticizing him. You’re saying, “Hey, you did this thing and it had this impact. What was going on?” So listening and resolving conflict. And in episode one, I talked about how you can get more work done as you cooperate with other people. The other day I was working in my office and I heard this. Stephanie: [00:17:52] Why doesn’t anybody play with me? Tom: [00:17:59] That was my daughter reenacting a scenario that happens on a pretty regular basis around here. How do we get other people to want to get involved? She was so frustrated that she couldn’t get people to help her with her goal of playing a game that she got more and more frustrated until she finally could not stand it. So how could she get them to want to play with her? It’s an important question and it ties in exactly to what we’ve been talking about on today’s episode. How do we get people to want to go along with the stuff we want to do? [00:18:32] People’s favorite radio station is WIIFM: What’s In It For Me? Now, in my daughter’s case, she was crystal clear on what was important to her, what’s in it for Stephanie, but not so clear on why others needed to stop what they were doing to play along with her, to go along with the game that she had in mind. [00:18:53] I’ve got to tell you, that’s how it is at work, too. If other people on your team cannot figure out why they should stop what they’re doing and play with you, they’re not going to play with you. Whether it’s delivering the work that you need or whether it’s attending your meeting, or whatever. And so you need to think about how you can get people to want to play along. And it really comes down to what’s in it for them. If you can focus your communication around what’s in it for them as opposed to what’s in it for you, you’re much more likely to get the equipment, or the software, or the people, or the time, or the cooperation that you need. [00:19:37] I came back to some of these ideas in episode eight when I talked about how it requires more than just great engineering skills. It’s really about relationships. What are you doing to build relationships? Today I want to be a little bit like my dad. I’m not telling you what I think. I’m telling you what I know. One of the things that I absolutely did wrong when it came to my time in corporate America was that I focused on being the best whatever I happened to be at the time. I worked hard to understand my job and do that as well as I possibly could. [00:20:15] So, you might be asking, well, “How could that be wrong?” Well, it’s not wrong to be good at your job. But one critical mistake that I made was I didn’t make enough connections with other people along the way. Let me suggest that when it comes to career opportunities, it’s not just about how competent you are at your work. In fact, I’d argue it’s at least equally important who you know and who knows you. [00:20:46] Now when you think about who knows you, how do people know you? I recently went on a brief trip with a group of folks from my church. And we spent a few days working on projects together where we helped an organization that provides disaster relief. While we were working shoulder to shoulder, one of the other participants said to me, “Tom, I’ve learned more about you in the last two days working beside you than I have in the last six months seeing you every week”. He was right. We did learn about each other when we were working together. [00:21:20] So let’s get back to my professional work. I spent a decade at Marriott. I have many good memories about being a part of that company. I had good opportunities, I learned a lot. And during those 10 years, I essentially held 2 positions. Two. Looking back, I am sure that I would have found more opportunities if I had been willing to branch out and do different things. But I liked being good at what I did, and I liked being in my safe space. It was risky and unsafe to try different things, so I didn’t do it. [00:21:55] And finally, when it comes to working with teams, in episode five, I talked a little bit about how you can work more effectively with remote team members. What do you do when your team members are not with you on your job? The first thing I want to say about this is that working with remote team members is essentially the same as working with local team members. But here’s the key difference. The key difference is that when you work with somebody who’s in the same building you’re in, you’re likely to bump into them in the hallway or on the way to lunch or taking a coffee break by the coffee machine or the snack machine. Or you’re gonna run into them on the way to the same meeting. Or right after a meeting, you’ll probably chat with them a little bit. That’s the difference. [00:22:51] That with a remote team member, you don’t have that informal communication opportunity. Typically, if you had something that was going on that was a little bit of an annoyance, or it was a challenge that you were facing, typically what you could do is just what I would call poke your head into their office. Stop by. Just have an informal communication. But with these folks who are remote, it is much more difficult to do that. Because it just seems like a barrier that you have to overcome to make that connection. And I will tell you that it’s more than it seems like it’s a barrier; it’s an actual barrier to communication. So, working with remote teams is the same as working with local teams, but you have to be intentional about making a connection with them. [00:23:48] So now we’ve talked about how, level one, that individual perspective; level two, the team member perspective. Let’s move on to level three and talk about what it means to be a team leader. Because I know some of you are actually in that role now. In episode six, I introduced the concept of having a new mindset. How do you need to think differently when you start to become the leader of a team? [00:24:18] Your personal contribution as that individual contributor has been that story of your success, and now your story has got to develop a little further. Everything you’ve done still applies, but you have to apply them a little bit differently. Rather than seeing yourself as a brick layer, you need to see yourself differently. And Marshall Goldsmith says, “What got you here won’t get you there.” In this story, you’re thinking about what made you successful. If you’re gonna get to the next level, you’re gonna have to change your thinking. You’re no longer that individual contributor, just the bricklayer. [00:24:58] The first step in being successful is thinking differently. You’ve got to change your mindset. So you don’t measure yourself anymore by the number of bricks that you lay, or the quality of the work, the strength or height or straightness of the wall, or how timely you’re able to put the bricks down. No. Now you have to see yourself differently. Now you have to think about being the general contractor who’s building the cathedral. Of course you know how to lay bricks. Of course you do. And you’re still in the business of getting walls built but they are the means to the end. They’re not the end themselves. The grand cathedral is the end. And it’s made up of the walls and the other pieces that are created and assembled by various craftsmen all over the organization. [00:25:50] So as we reflect on season one, we’ve talked about level one, individual thinking. We talked about level two, working as a team member. We talked about level three, working as a team leader. And as we move forward with season two, we’re gonna focus a lot more on the idea of being a team leader. Some topics that I’ve already got prepared for season two include more about that leader’s mindset; how do you need to think differently if you’re gonna be the leader. What does it take to influence leaders more effectively and developing influence on the basis of permission, not position? [00:26:31] We’re also gonna talk about how to set goals for your team members and how to hold them accountable to deliver those things that you’ve set out for them. What does it take for you to do real, meaningful career development planning, professional development planning and career development planning for your team? And another topic that I want to spend some time on in season two is managing up. How do you get buy-in from leaders when you don’t personally have the power to make the decision that you need to make? [00:26:56] Now, as I’ve told you, as we’ve been doing this together, I’m gonna continue to share what I’m learning from you and in my work with clients. And if there are topics that you want me to cover, please reach out to me; coach@brighthillgroup.com. I’d love to hear from you. [00:28:10] Maybe you’re at level three, or the team leader level, and you’re starting to think about how you could begin to influence the people who do report to you and your peers and the people that report to your peers. Or maybe you’ve approached that team builder level, level four, where you’re thinking about, “What does it take to grow people into leadership roles?” Whatever your level, I want you to think about what could you do, what’s the smallest possible step you could take to move forward? Maybe it’s just going back and listening to one of the episodes I referenced here in the podcast and maybe it’s thinking about a person you need to influence or a step you need to take to do something like that. [00:28:53] Whatever your level, I want you to think about what you could do to make a difference. And don’t forget you could check out the episode page for a download that lists out the four levels of thinking and gives you some specifics about those four levels of thinking. And that’s today’s Episode Hack. [00:29:11] One final note in this last episode of season one. I just want to say thanks. Thanks for taking me with you. I know you’re investing in you and I know listening to this podcast is one of the steps you’re taking to help you grow. And I just want to say thanks for including me on your journey. And don’t forget, if there’s any question you have or some topic you’d like me to tackle, feel free to reach out to me. It’s coach@brighthillgroup.com. I’d love to hear from you. Thanks. [00:29:39] Thanks for listening to this episode of Becoming a Geek Leader. You could play a part in helping the podcast to grow. If you enjoyed it, please do me a favor. The way to get the podcast to grow is for you to go to iTunes and give it a rating. If enough of you give me a good rating in iTunes, this podcast will show up in their New and Noteworthy section. Being a New and Noteworthy is a great way to attract more listeners, and having more listeners helps me have the support to keep the podcast going. [00:30:02] There are three simple steps to giving me a rating. One, go to the iTunes store in the podcast section; two, search for Becoming a Geek Leader; and three, give the podcast a great rating. And while you’re there, why not write a quick review as well? Thanks. [00:30:21] This is Tom Cooper. Thanks for listening. Be sure to join me next time for another episode of Becoming a Geek Leader. Join me in my mission of discovering better ways to lead others at work and at home.